I must confess (pun intended) that I can see why there was some controversy when it came to the construction of the Cathedral of Our Lady of the Angels that serves as the Mothership for the Archdiocese of Los Angeles. 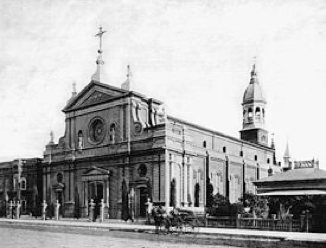 From 1876 until 1994 the Cathedral of Saint Vibiana (seen below in an old photo) had that distinction, but it was severely damaged in the 1994 Northridge earthquake. 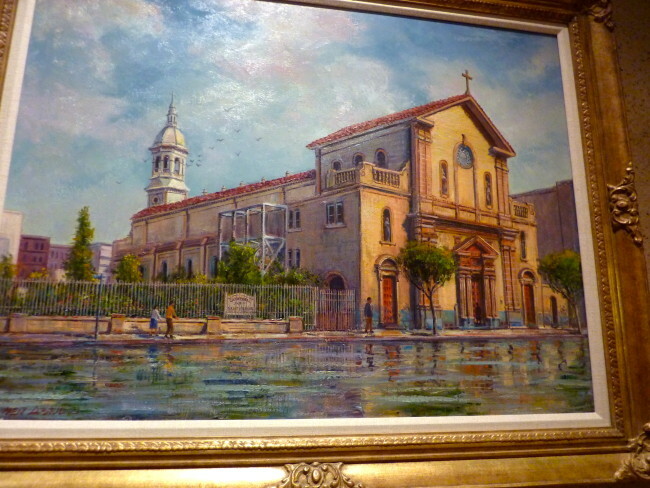 There was considerable controversy about rebuilding Saint Vibiana, and in 1996 it was decided to build at another site. 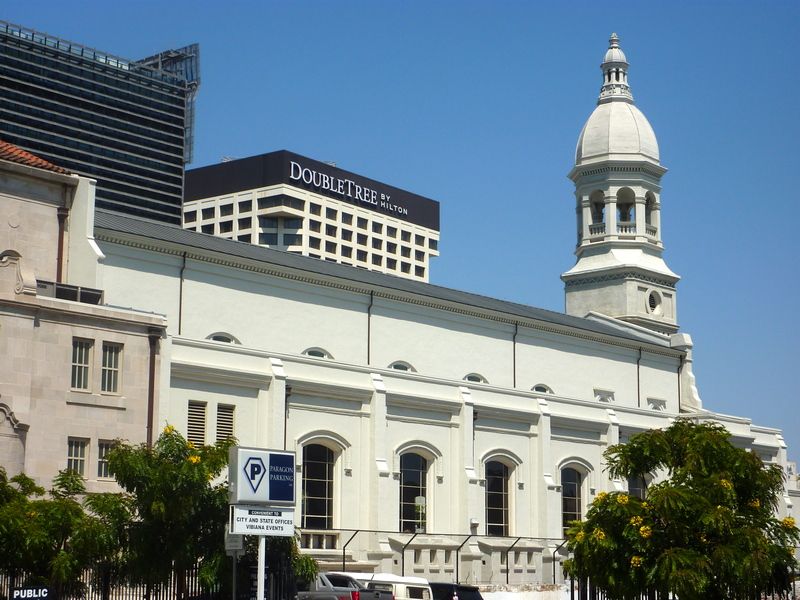 The Cathedral of Saint Vibiana was sold to a developer in 1999, who transformed it into a performing arts complex called Vibiana (seen above). 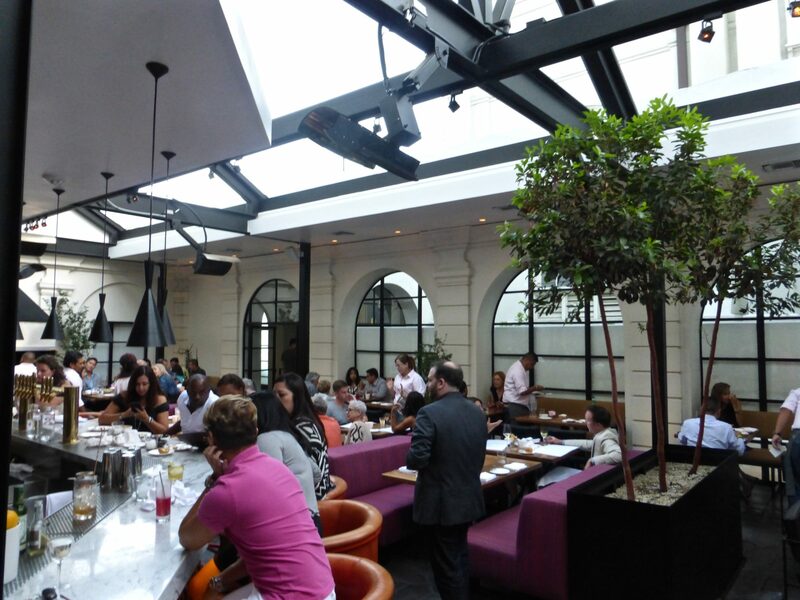 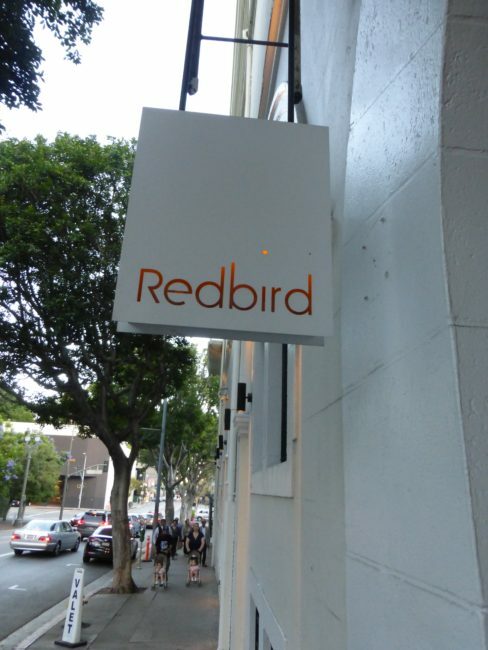 A couple of years ago Saint Vibiana was transformed into a hip L.A. restaurant, Redbird (see Tom’s Dining Out…Redbird). 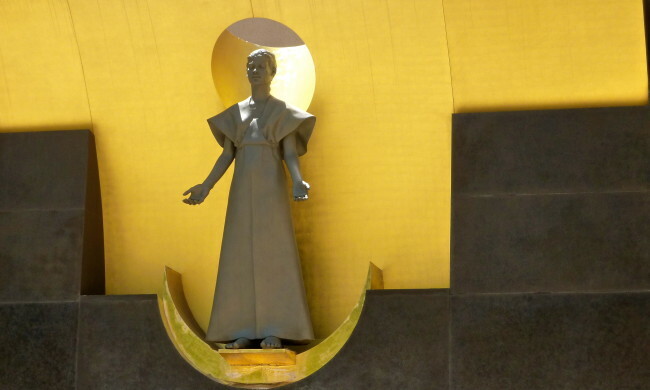 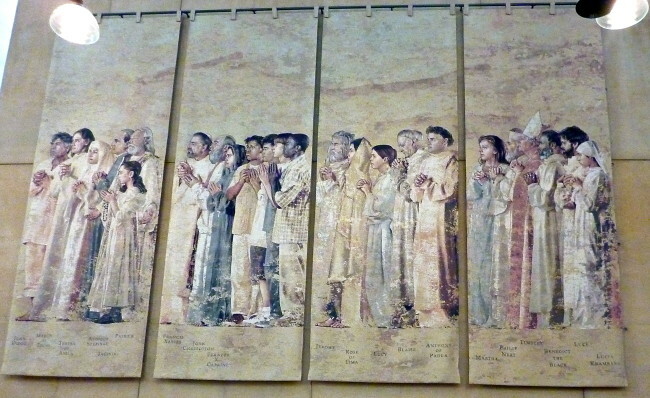 In 1996, then-Cardinal Roger Mahony (before he was ousted due to his silence regarding priest molestation of children) revealed that the new cathedral would be named the Cathedral of Our Lady of the Angels, a title that had already approved by the Pope in 1945 when plans for the reconstruction of St. Vibiana’s went unfulfilled. Cardinal Mahony’s decision to rebuild the cathedral in “elaborate and post-modern architecture” was not met with universal approval. 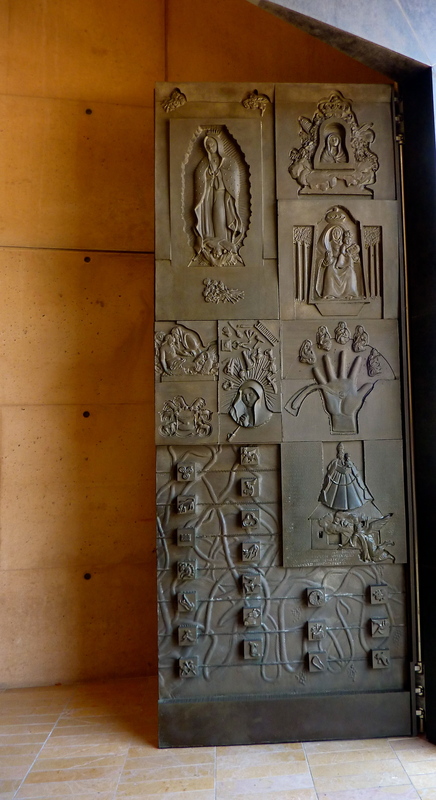 It was argued that the expense to build this cathedral was “unnecessary, overly-elaborate and money could have been better spent on social programs.” It was, of course, built and opened its doors in 2002. 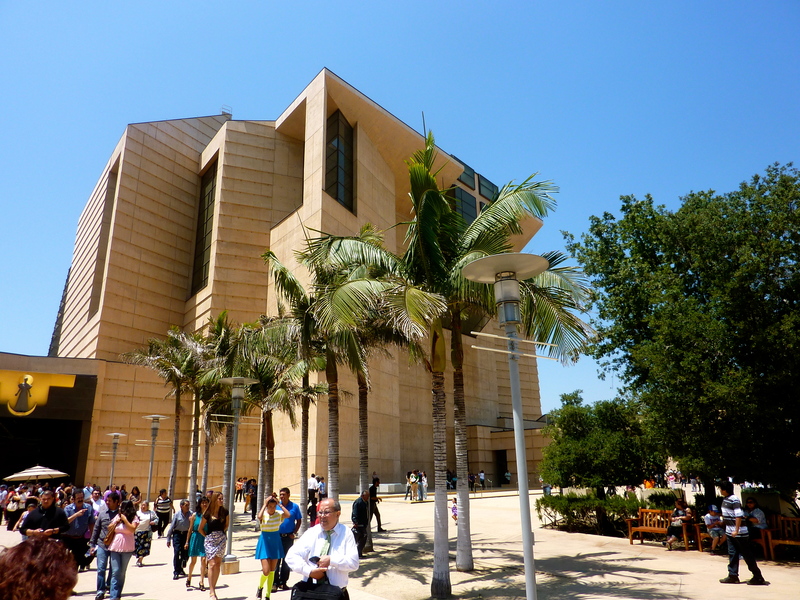 Rafael Moneo designed the cathedral, a Pritzker prize-winning architect from Spain. 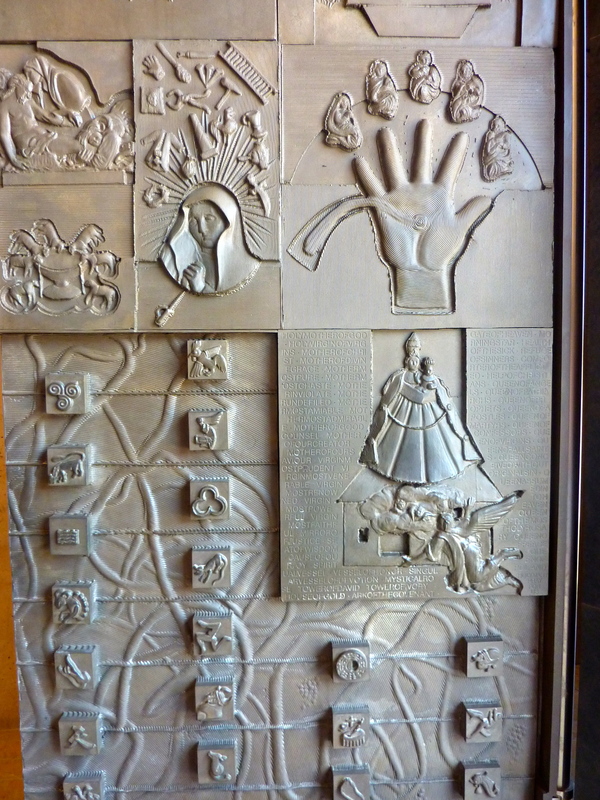 The bronze doors and the statue of the Virgin Mary over the entrance were designed by Robert Graham, a local California sculptor, and husband of actress Anjelica Huston. 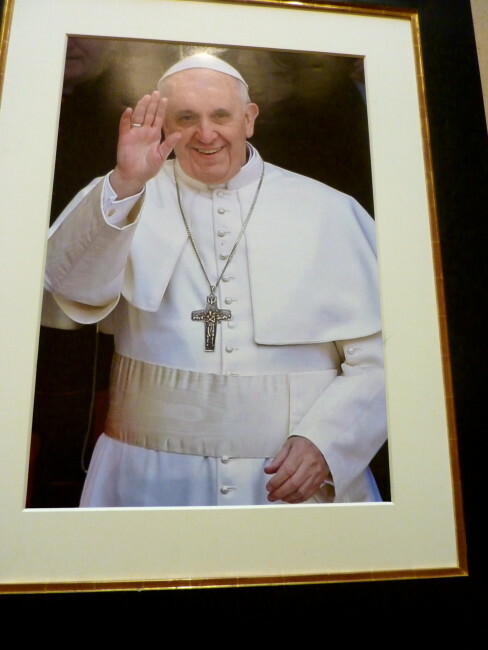 Walking through the hallway, Pope Francis welcomed us (well his photo looked like he was welcoming us). 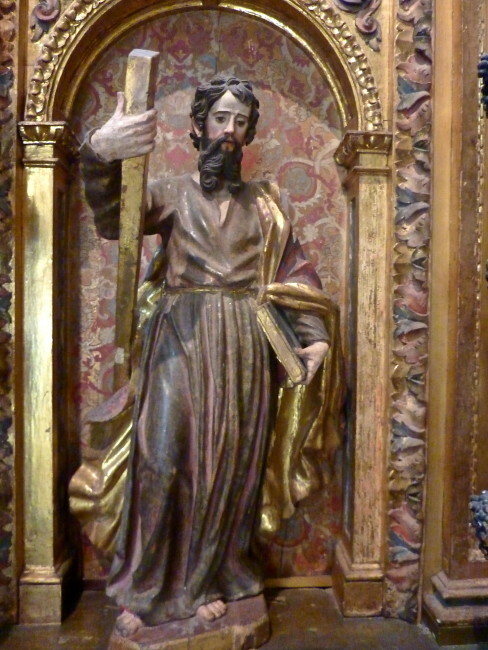 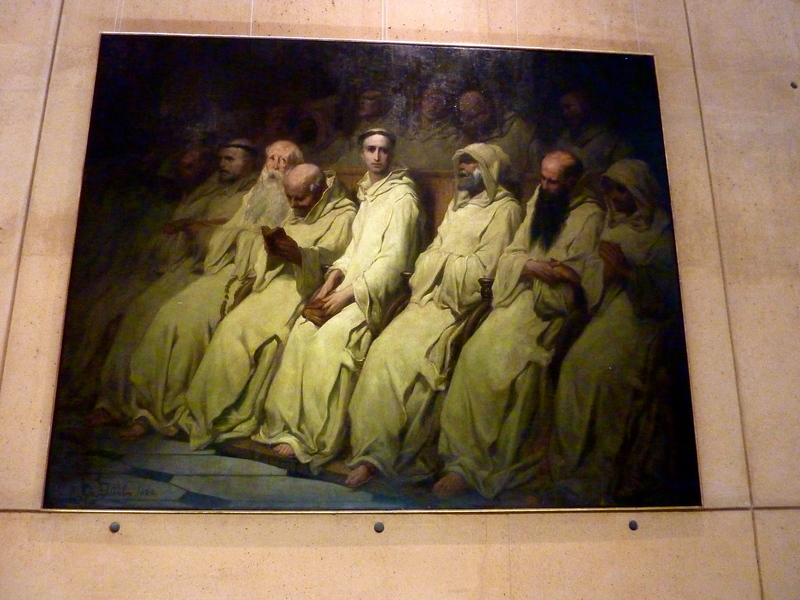 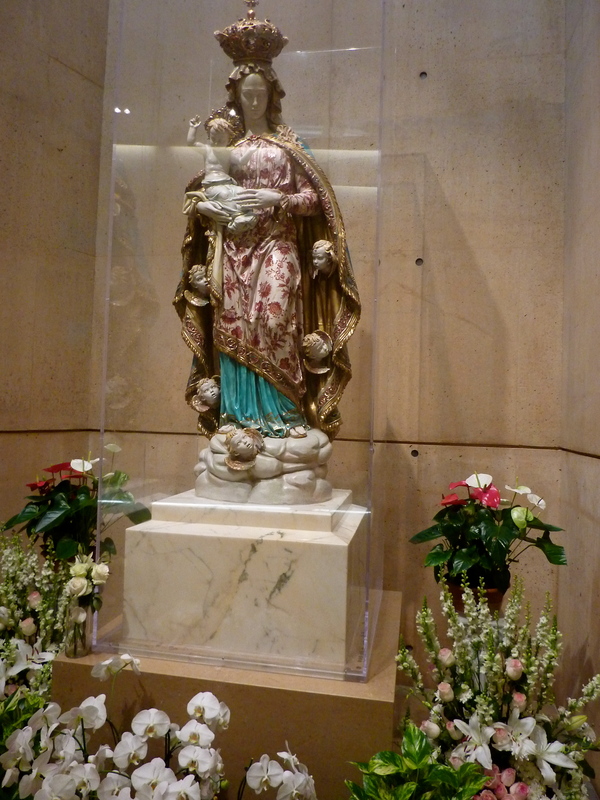 We stopped and looked at the Our Lady Of The Angels sculpture and a 19th-century painting, History Of The Neophyte. 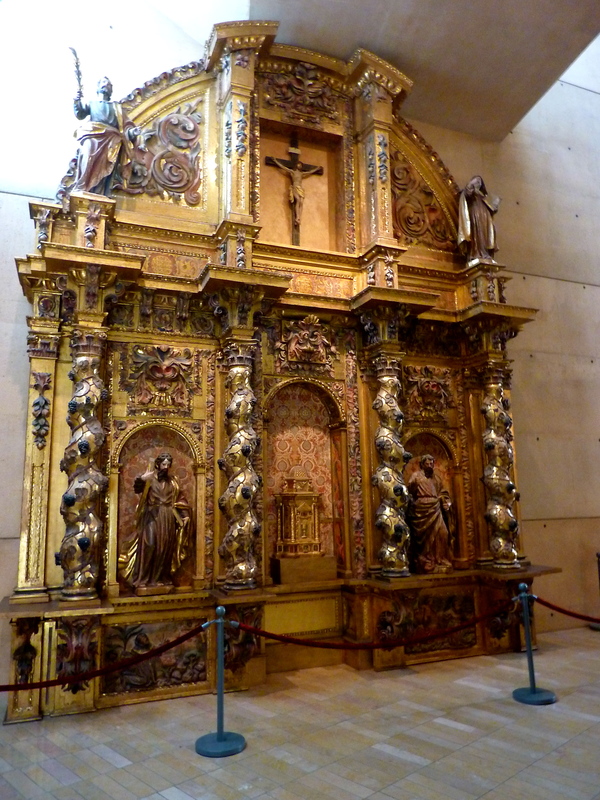 It is an original relic piece taken from The Tilma of Our Lady of Guadalupe. 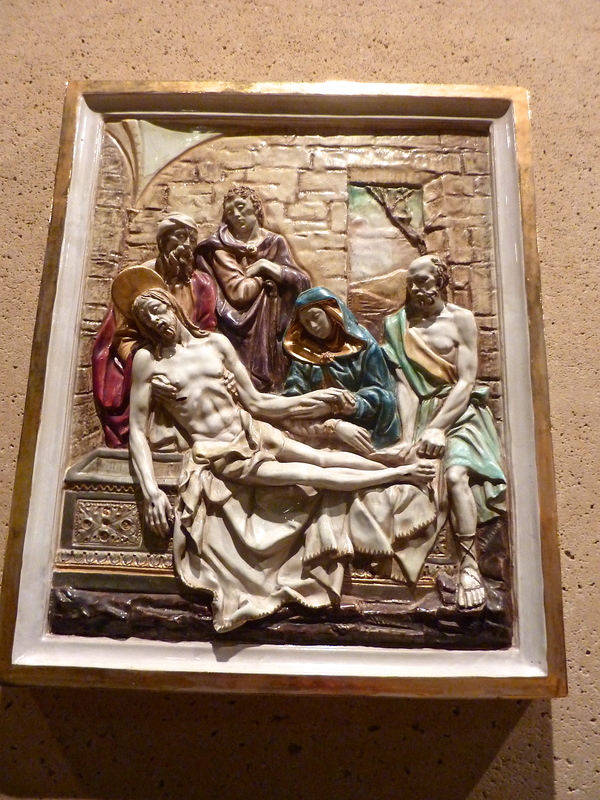 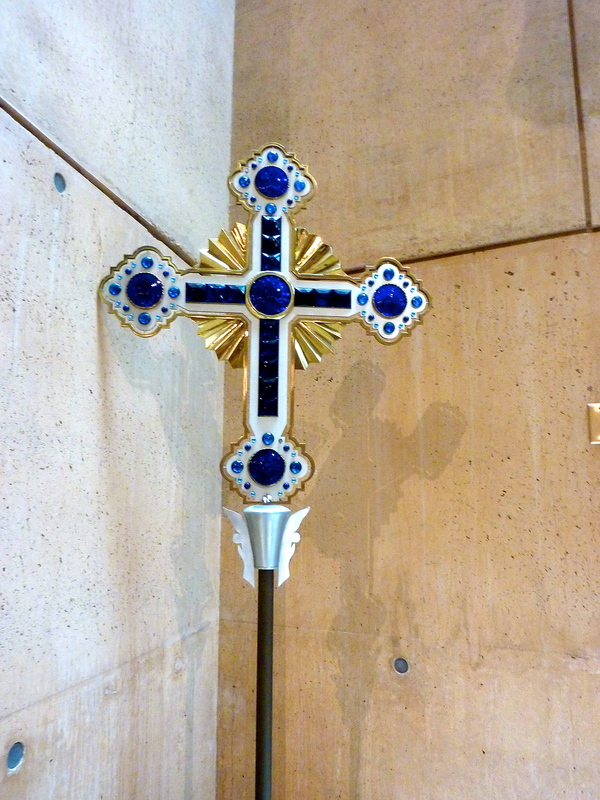 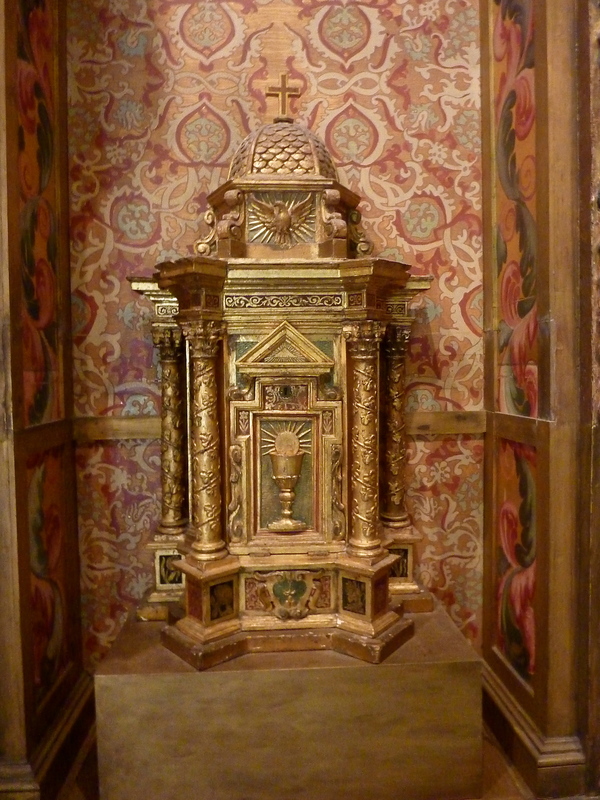 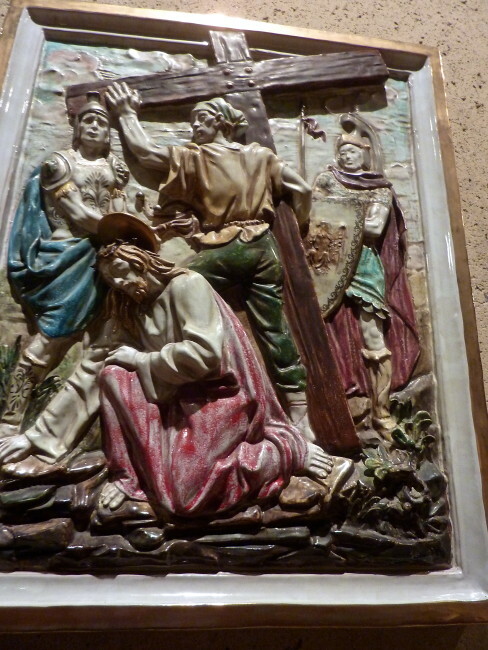 Although beautiful, we thought this ornate piece looked a little misplaced here at Cathedral of Our Lady of the Angels. 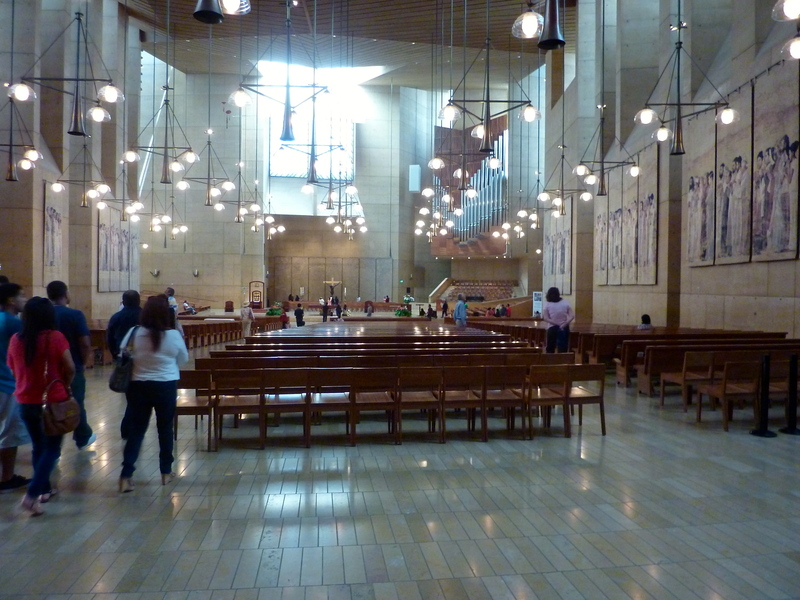 The inside of the cathedral is rather stark. 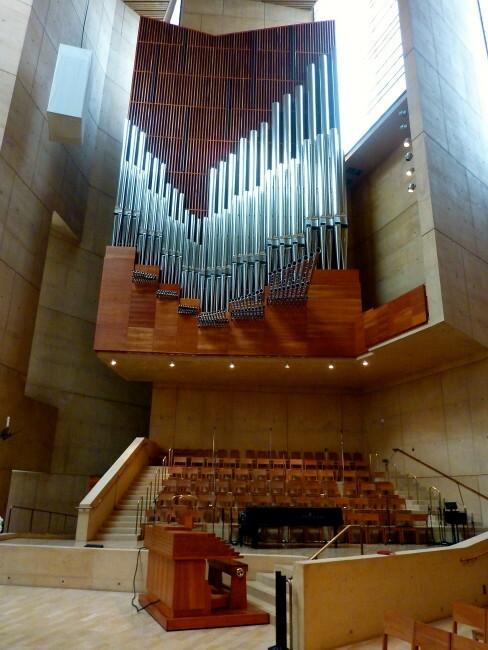 You can’t miss the giant organ…or the giant chair. 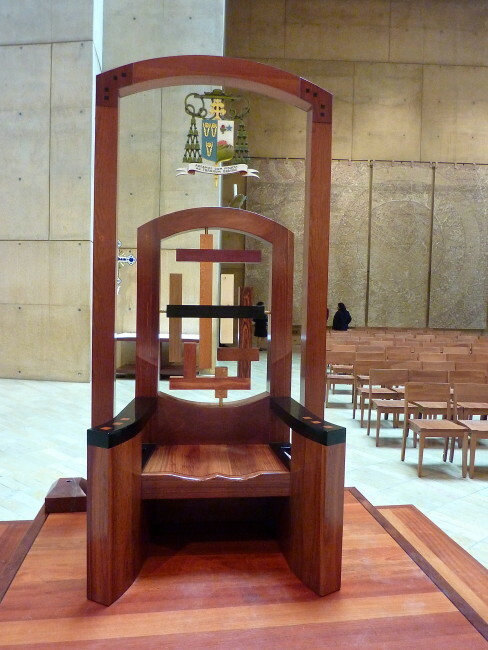 That big chair is called The Presider’s Chair. It’s used when the Celebrant Priest of the Eucharist is other than the Diocesan Bishop. The pipe organ was commissioned from Dobson Pipe Organ Builders, Ltd., of Lake City, Iowa. 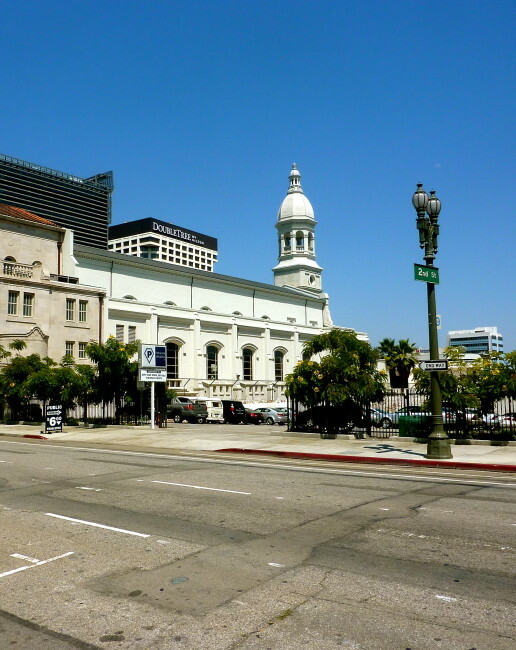 According to one authority, it is the 89th largest pipe organ in North America and the 143rd largest in the world. Actually, the cathedral’s most beautiful area is the large Crypt Mausoleum on its lower level. It contains 6,000 spots for burials. 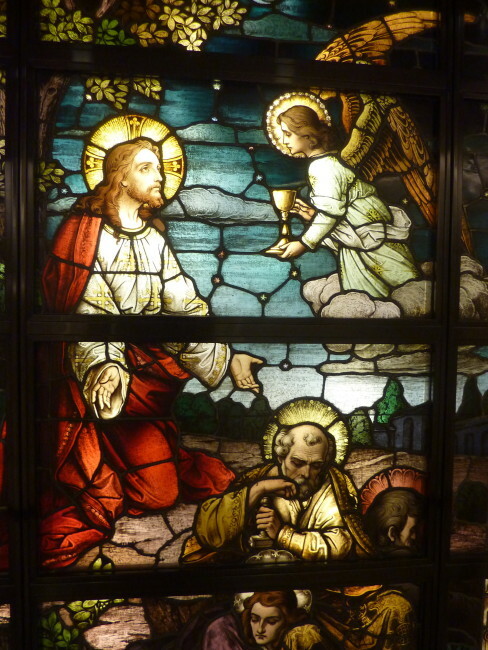 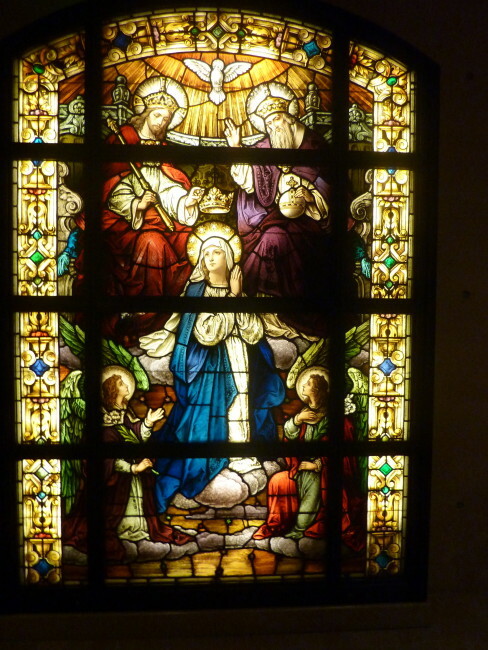 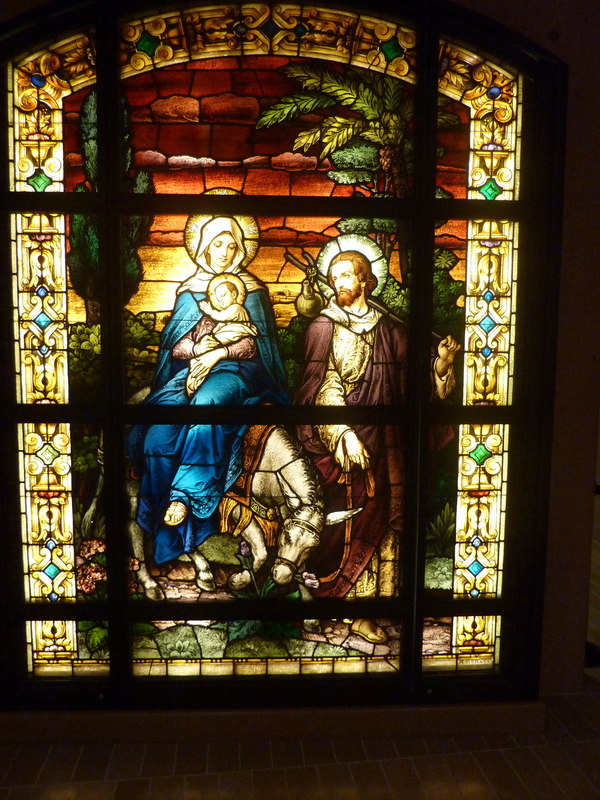 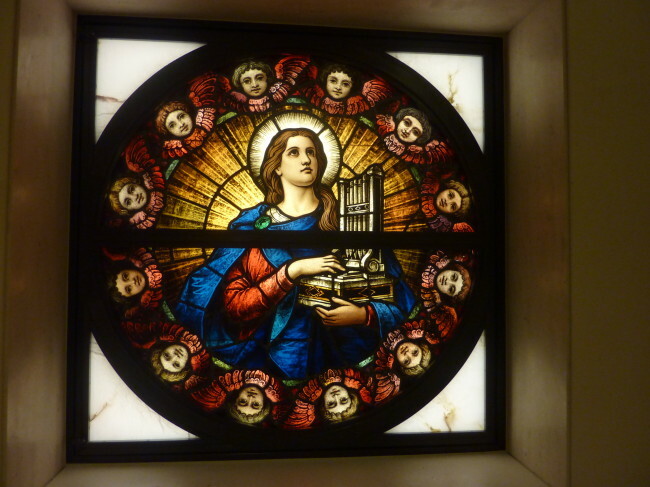 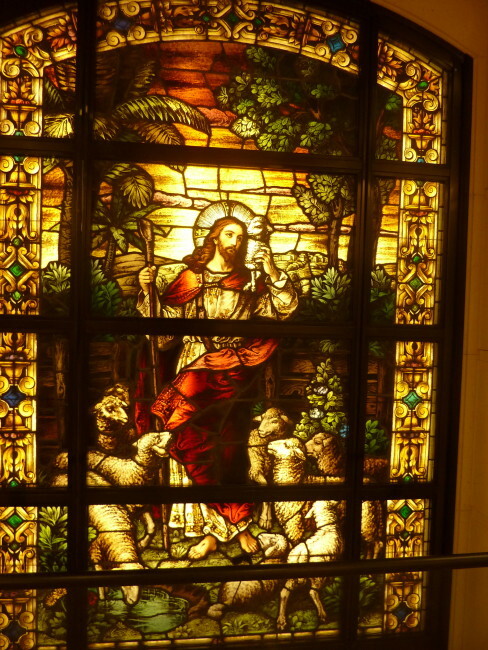 It’s decorated with stained glass windows from Saint Vibiana’s Cathedral and has two new windows of guardian angels. Proceeds from the sale of burial spaces are placed in an endowment fund for the financial stability of the cathedral. 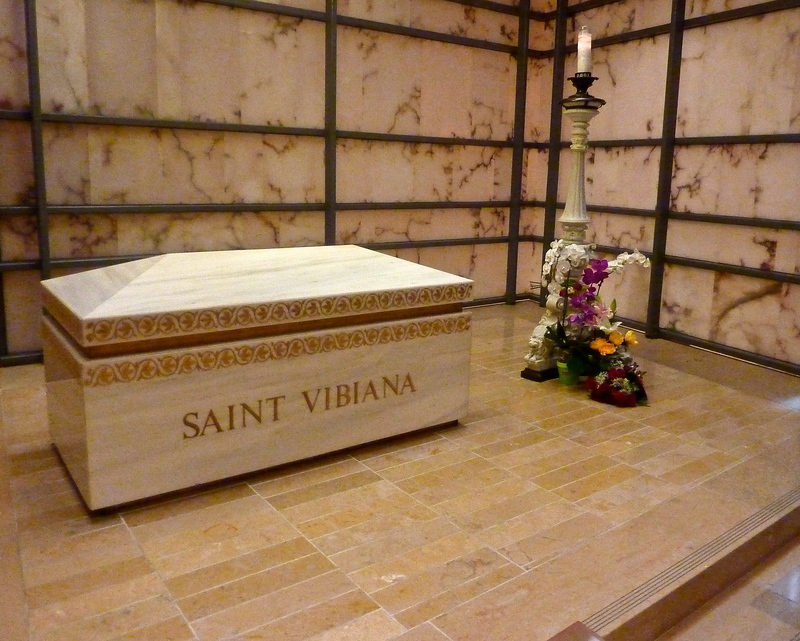 Notable among those entombed here are some previous bishops of Los Angeles and Saint Vibiana, a 3rd-century Roman martyr and the patron saint of Los Angeles. 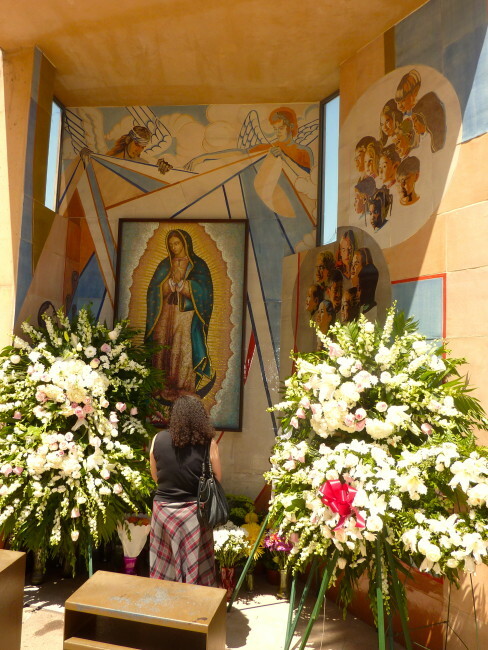 Her relics were discovered in the Roman Catacombs in 1853 and brought to Los Angeles a year later (she obviously liked our weather better here). 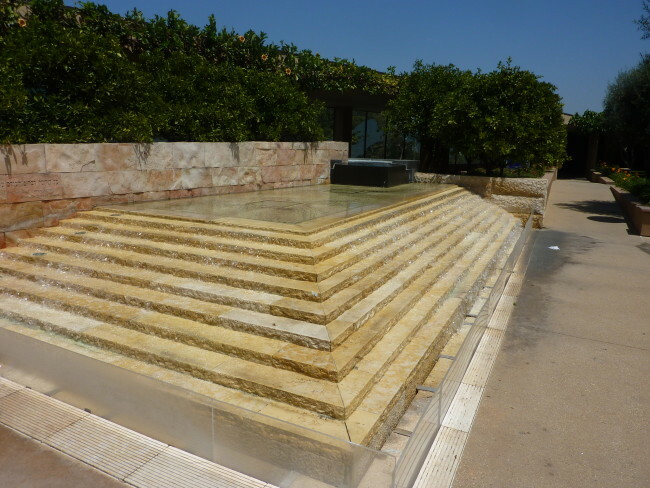 As we walked through, Tracy said, “Look who else is here.” Looking to my right, there was the tomb of Gregory Peck (Guns of Navarone is one of my all-time favorites) and his wife. 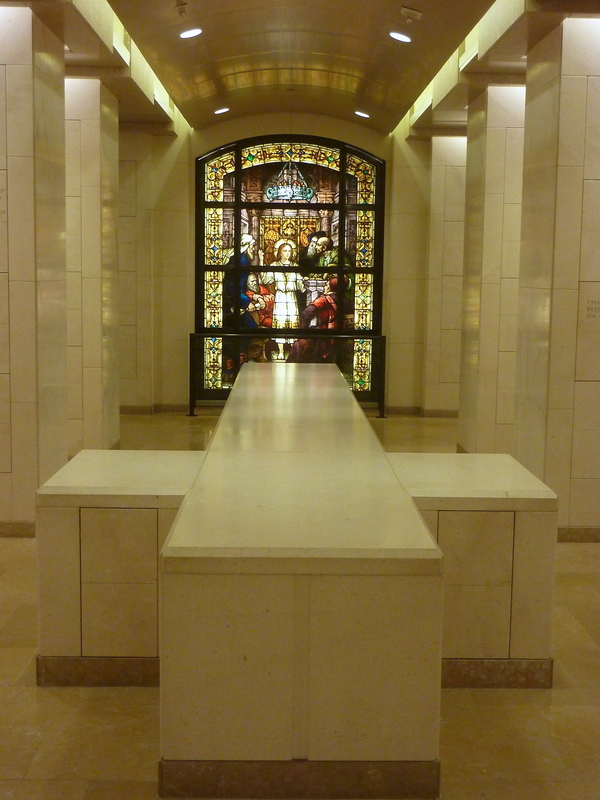 We wandered around the Crypt Mausoleum for quite some time. There were other beautiful art pieces, as well. There was also a nice painting of the old cathedral and other artwork that made this our favorite part of our self-guided tour. Back outside, we wandered in the large courtyard that has a fountain, a cafe, and a shrine that covers a total of 58,000 square feet. 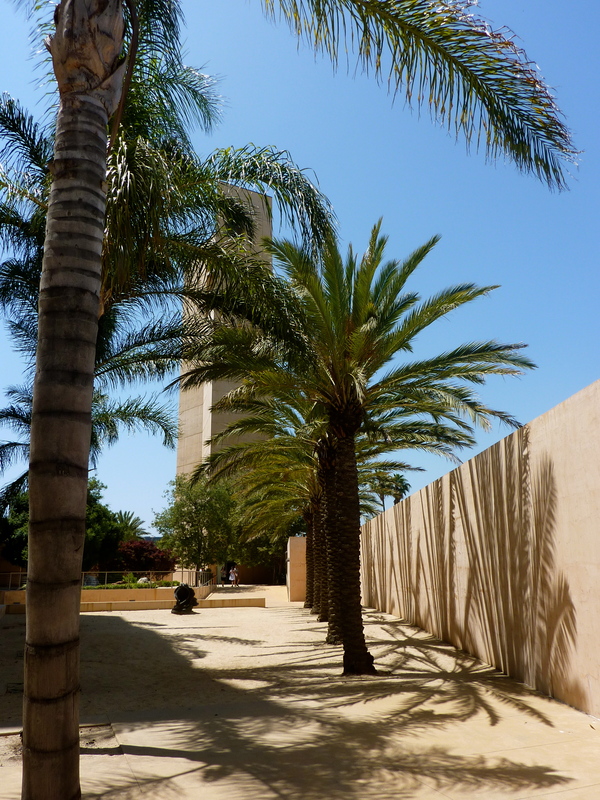 The cathedral itself is 333 feet long, which they said was purposely built one foot longer than St. Patrick’s Cathedral in New York. 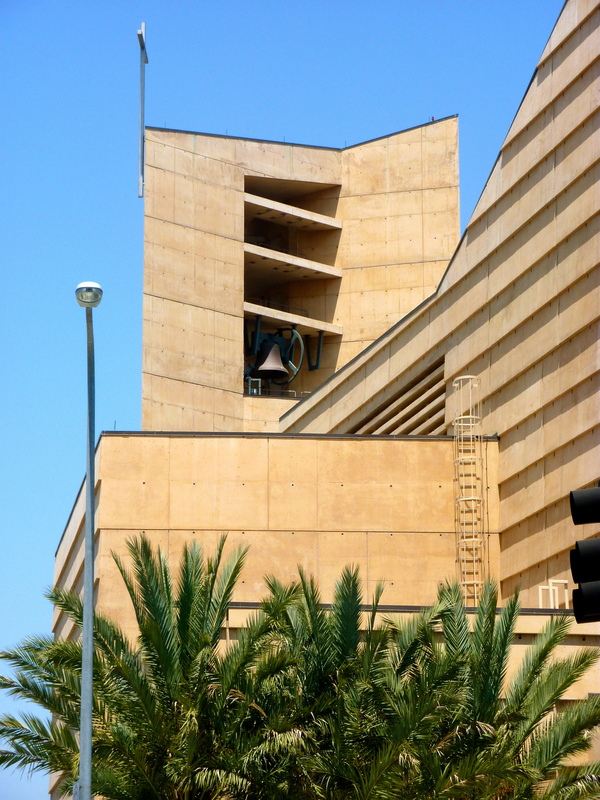 In the Italian tradition, the tall bell tower is detached from the cathedral building. 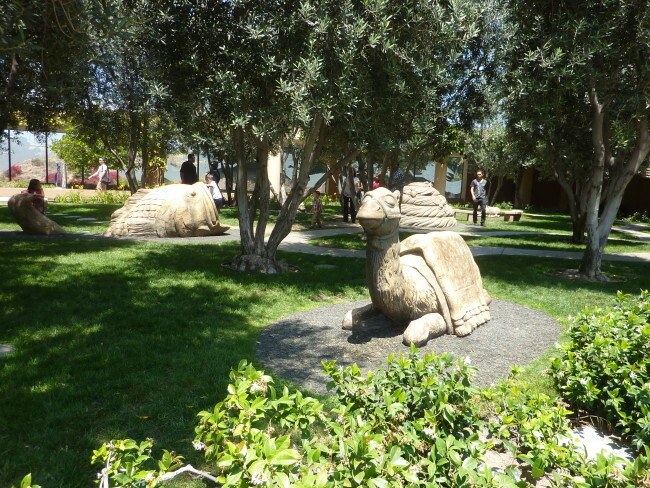 There’s also a place for kids to play. 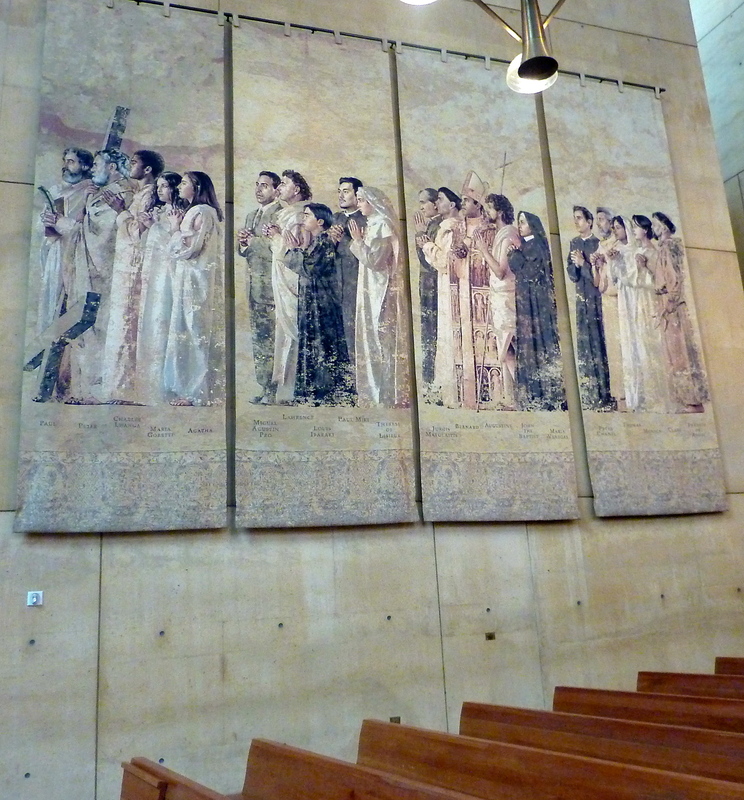 I liked the Cathedral of Our Lady of the Angels more than Tracy. 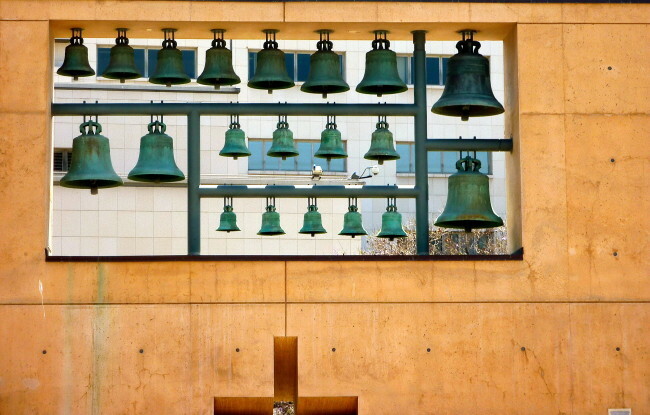 It’s different to be sure, but certainly, a worthwhile (and free) place to visit when you’re in L.A. 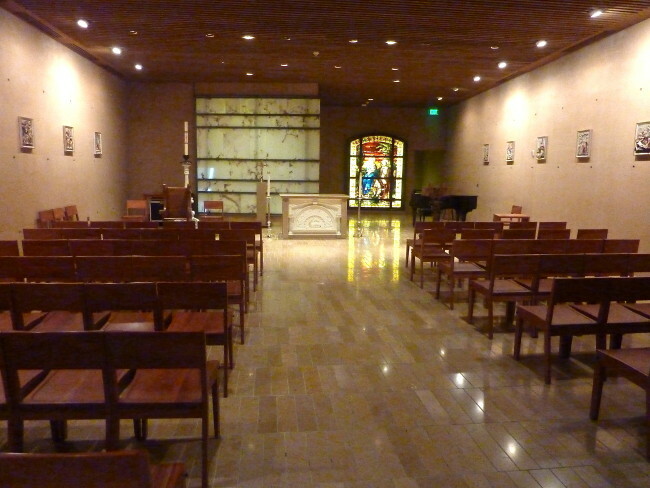 Hours: Monday – Friday 6:30 a.m. – 6:30 p.m.
Saturday 9:00 a.m. – 6:00 p.m. • Sunday 7:00 a.m. – 6:00 p.m.